What do you guys think? Is that a thing any of you would want to buy? E-mail or tweet me and let me know! Big week! Lots to talk about. Let's go! First of all... the Vancouver Comic Arts Festival is this weekend, and it's free to attend! If you are going to be in the Vancouver area, you have to come. You also have to tell everyone you know to come. It is basically the law. Perhaps direct yourself and others to this tumblr post I made, in which I namedrop a ton of our awesome guests and give you the hard sell. Second of all! 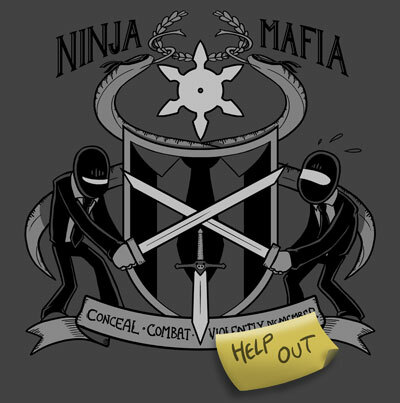 I have completed the Ninja Mafia Coat of Arms. This was the number-one result in our Book Club member poll to pick what our next exclusive club desktop would be, and in keeping with the theme, I have done my best to make it awesome-yet-classy. For those who don't know how the book club works, here is the deal: when you purchase a copy of Sam and Fuzzy Are Very Famous, you don't just get a (great, heavy, enormous) book. You also periodically get bundles of free digital bonus goodies emailed to you! The next bundle emails out on June 6th, and includes the Coat of Arms desktop, the Team Fortress 2 parody desktop, and some exclusive pre-web Sam and Fuzzy comics. If you want in on the latest pack, just make sure you place an order for your book before the 6th. And if you've already got a book, worry not... you'll receive the bundle automatically. Bam! Friends! (Especially Vancouver friends!) Could you do me a favour? I have written up a pretty good tumblr post about the Vancouver Comic Arts Festival. Any assistance pointing people in it's direction would be majorly appreciated! Sam worked at X-Per-S for about seven years total, starting shortly after he met Fuzzy and dropped out of college. (As seen in the ancient First Noel origin story.) I kind of view that time period of Sam's life as one very long, unambitious, slacker rut facilitated by Mr. Ackerman's inhuman tolerance and patience. After all, Sam wasn't even a good cab driver! Sadly, I am not! (I don't know of anyone else who is going, either, but I might just not have heard yet.) Are you going? Let me know how it is! I actually hadn't heard of it until recently. Anyhow, that's a wrap for this week! Next week: VanCAF! Vancouver Comic Arts Festival Next Week! Exciting times: the innagural Vancouver Comic Arts Festival is only a bit over a week away! If you are going to be in or near Vancouver on the 26th or 27th, mark my words: you absolutely must attend this shindig. It is the law! From webcomics alone (because I know you guys like those), we've got my creator comrades from Questionable Content, Dr. McNinja, A Softer World, Wondermark, Boxerhockey, Tiny Kitten Teeth, Wasted Talent, Weregeek, Filibuster, Family Man/Bite Me, Three Word Phrase, and a ton of other online old hands and new talents. There are also a ton of super-talented folks from the print universe, like Camilla D'Errico, Nina Matsumodo, and Mike Deas. It's a pretty killer line-up for any show, let alone one in it's first year. So Vancouverites and neighbours: come to VanCAF. Come for free! I only ask one thing of you -- please tell every human being you know about our show. And if you're coming, RSVP on Facebook to let us know! (It is hard to estimate crowd-size at a free show and we want to make sure we are prepared.) We don't have a huge marketing budget, but hopefully our awesome guest list and word of mouth will help get butts in the door and make this thing the success it deserves to be.